It's a long way down from 3500 feet, so it's best not to look. 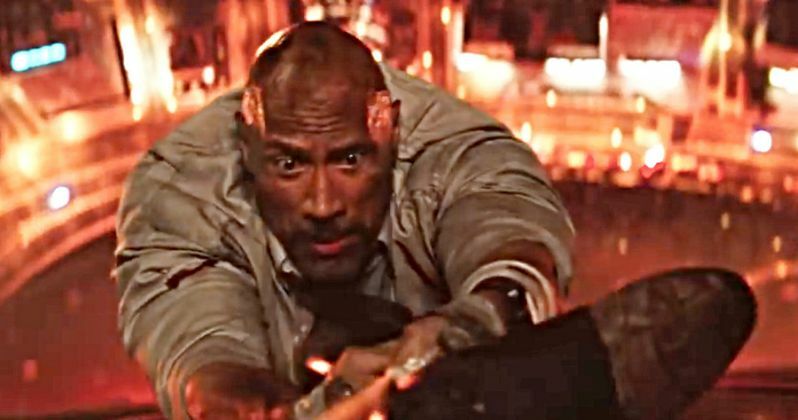 Global icon Dwayne Johnson leads the cast of Legendary's Skyscraper as former FBI Hostage Rescue Team leader and U.S. war veteran Will Sawyer, who now assesses security for skyscrapers. On assignment in China he finds the tallest, safest building in the world suddenly ablaze, and he's been framed for it. A wanted man on the run, Will must find those responsible, clear his name and somehow rescue his family who is trapped inside the building...above the fire line. Skyscraper's executive producers are Dany Garcia (Baywatch, Ballers), Wendy Jacobson (San Andreas), Eric McLeod (Kong: Skull Island, Pirates of the Caribbean series) and Eric Hedayat (The Great Wall, Real Steel). The film will be released by Universal Pictures. Dwayne Johnson is joined by Neve Campbell, Chin Han, Noah Taylor, Roland Møller, Byron Mann, Pablo Schreiber and Hannah Quinlivan. You can get your tickets now at skyscrapermovie.com. The movie hits theaters on July 13.